This week my spiralized meal was based on a recipe from the Inspiralized cookery book by Ali Maffucci, which is a brilliant book (and website) if you are just getting started with a spiralizer. It was called Prawn Daikon Pho, a daikon being a type of radish, sometimes known as a winter radish or an Oriental radish. I'd never heard of it, let alone seen one in the supermarket, but I did remember seeing something called a mooli that was also from the radish family. From internet research I've decided that daikon and mooli are either the same thing or at least closely related! 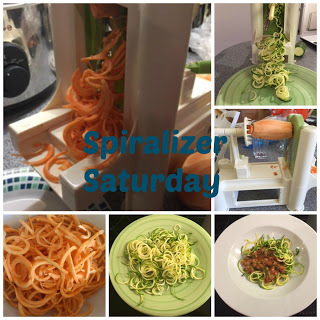 If you have any spiralizer recipes you want to share, please add them to the linky at the bottom of this post! I don't really like radishes as I find them too peppery so was a bit dubious about whether I would like mooli (and let's just say I'm not exactly known for liking new vegetables) - but I loved it! That may have had something to do with the sauce in this stir-fry but I am keen to try the mooli again (I used half of it in this recipe) in something else. The Inspiralized recipe also includes jalapeno peppers but I don't like spicy food; I also left out the spring onions, onion, and whole coriander leaves - and instead added fresh dill which I had from another recipe. Ali's recipe is also a Pho which is more of a soup - I find eating those very messy so made it a much drier stir-fry. It tasted really good and was very healthy - I was having a bad day thinking about how much weight I need to lose so this made me feel a bit better! Heat the stock, fish sauce, lime juice, coriander and ginger in a large wok and add the spiralized mool, carrot and the broccoli. Cook, stirring occasionally, until the vegetables have softened, then add the prawns and heat through. To serve, sprinkle with the chopped dill and a dash of lime juice if desired.